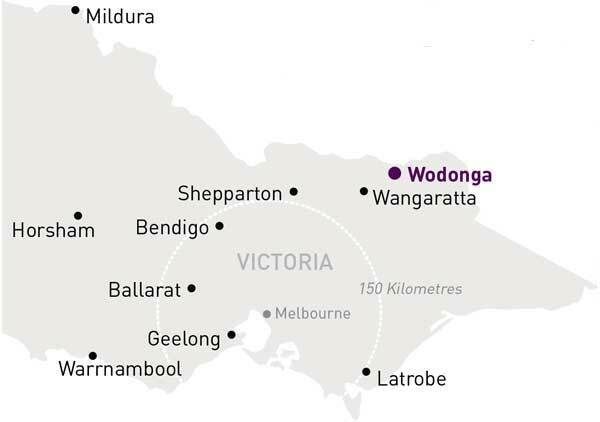 The gateway to Victoria and New South Wales, Wodonga is a major logistic hub, stock selling and food and metal manufacturing centre between Melbourne and Sydney. On the southern banks of the Murray River, Wodonga is the gateway to Victoria and New South Wales and one of three key cities in the Hume region, along with Shepparton and Wangaratta. It is the seventh-largest city in regional Victoria in terms of population. Part of Hume's Ovens Murray region, Wodonga is located approximately 300km northeast of Melbourne on the Victoria-New South Wales border and across the river from its twin city, Albury. Situated on the Hume Freeway, and the Melbourne to Sydney rail line, Wodonga is well recognised as a strategic hub along the eastern seaboard. Its proximity between Australia’s two largest cities, Melbourne and Sydney, provides key strategic advantages; the city services the surrounding pastoral runs and is a major stock selling centre. A number of manufacturing industries have been established in Wodonga. Wodonga has experienced strong population growth over the last 25 years, with much of this growth coming from overseas and surrounding municipalities. Wodonga is closely linked with the New South Wales city of Albury, as they are adjacent to each other and separated only by the Murray River. The culture of Wodonga is centred on the river and Lake Hume, with fishing and water sports being popular activities. There are many outdoor activities that are popular with the locals, such as cycling, hiking, camping and sightseeing. Wodonga has a thriving arts scene, with a professional theatre company, contemporary art galleries and live entertainment venues. The city has its own dedicated arts and cultural precinct, Gateway Village, which houses a clustered group of diverse cultural and arts offerings. Wodonga is ideally situated to an array of gourmet food and wine businesses, owing largely to the influx of Europeans who brought their food traditions to Wodonga. Cheese and wine are also regional specialities, with many vineyards surrounding the city. Wodonga’s economy is diverse and resilient. From small niche businesses to multi-national companies, there are approximately 2,683 businesses that fuel the economy, which has a workforce of around 17,700 people. Manufacturing is the primary employment industry in Wodonga, followed by health care and social assistance, public administration, and safety including defence. In terms of value added activity, manufacturing is the largest performing sector in Wodonga, generating almost $375 million each year. Public administration and safety, retail, hiring, real estate services, health care and social assistance are also key industry sectors. In the five-year period 2009-2014, there was strong employment growth in health care and social assistance; accommodation and food services; education and training; arts and recreation services and transport, postal and warehousing. The RDV information portal page has more detailed data and statistics on the Wodonga region and regional Victoria more broadly.